Christie will be showcasing their new laser projector as part of the widest range of visual display solutions at InfoComm 2014 this week. Additional audio visual solutions at the show include Christie's new laser phosphor 1-chip DLP projectors, new LED tiles and LCD panels, the new Roadie 4K25 and 4K35, and a new Christie LX1750 3LCD projector for fixed installations, rental and staging, education, business, government and industry, sports and entertainment, houses of worship, meetings and events, and hospitality. 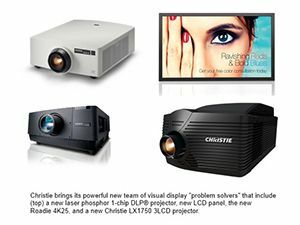 At InfoComm, Christie’s all-inclusive solutions will be highlighted in seven distinct zones, including one showcasing the large, curved Christie Velvet LED display, a 4K zone featuring a blend of two Christie 4K25 3-chip DLP projectors and two stacked Christie Roadie 4K35 3-chip DLP projectors, and Christie's family of collaboration tools. All content will be managed by Christie Spyder X20. Christie GS Series Laser Phosphor Projectors. Christie is expanding its G Series projection family to include solid state illumination in WXGA (DWX555-GS), HD (DHD555-GS) and WUXGA (DWU555-GS) resolutions. Using 1-chip DLP and a laser phosphor illumination system, the Christie GS Series provides an astonishing 20,000 hours of lamp-less operation and recommended for fixed installations where high resolution applications are required, such as boardrooms, higher education, houses of worship, and smaller entertainment venues. Christie Velvet. Christie expands its line of tiled displays with the introduction of Christie Velvet high resolution indoor LED tiles that provide high image quality and are seamless to integrate. The new, smart design LED tiles are available in various sizes and can be built-to-order in 1.875 mm, 2.5 mm, 3 mm and 4 mm pixel pitches. With wide-viewing angles and exceptional image clarity, the tiles are suitable for indoor video wall applications, such as retail, hospitality, corporate lobbies and control rooms. Built for 24/7/365 use and backed by industry-leading warranty and trusted pre/post sales service, the high performance LED tiles can be used with Christie’s image processing and content management software. Christie FHQ841-T 84-inch UHD LCD Panel. The new 84-inch “plug and play” Christie FHQ841-T multi-touch UHD LCD panel features 3820 x 2160 resolution, anti-glare glass and 10 simultaneous touch points. For customers and integrators who want a single source provider to meet all of its products and service needs, Christie offers a wide selection of displays that can be bundled with options such as Christie Brio integrated collaboration system, enhanced service plans and on-site support. Christie FHD552-X 55-inch LCD Panel. Christie’s 55-inch ultra-narrow bezel LCD panel features a reduction in tiled space by 35 percent to just 3.5 mm between screens for a minimal loss of content. The Christie FHD552-X tiled display wall has full high-definition resolution, high pixel density and a LED-backlit screen. Images look sharp at any distance, with controlled brightness suitable for a variety of indoor environments. The Christie FHD552-X is compatible with Christie JumpStart and Christie Interactivity Kit for a fully interactive digital experience. Christie Roadie 4K25 and 4K35 Ruggedized Projectors. The Christie Roadie 4K25 and Christie Roadie 4K35 3-chip DLP® projectors are built to withstand the rigors of the road delivering 25,000 and 35,000 lumens respectively. Both are ideal for rental/staging applications and offer 4K 60Hz projection that features industry-leading Christie TruLife™ electronics with 3G-SDI and Display Port as standard inputs and optional HDMI and DVI input modules. Christie LX1750 3LCD Projector. Following on the heels of the highly successful Christie LX1500 comes the next generation Christie LX1750, offering a powerful 16,000 lumens (17500 center lumens), 4D color technology for superior color reproduction, and professional design. The LX1750 is ideal for houses of worship, large conference rooms, higher education, medium-sized auditoriums, and staging applications. The Christie LX1750 also features a suite of eleven optional, high performance lenses to support virtually any installation or venue, along with a fully motorized lensing system that offers easy setup and configuration. Christie Brio Team. Christie Brio Team, the newest model in the Christie Brio family of presentation and collaboration systems, is a plug and play unit that makes it easy for individuals to wirelessly stream content onto displays from devices such as PCs, tablets, smartphones. Users can share content, edit in real time, save their work and capture action items for quicker follow-up while in study areas, small meeting rooms and huddle spaces. Brio Team, with its integrated Wi-Fi, AirPlay and WiDi receiver, requires no additional software apps, external dongles or local area network. Christie Partners With Euromet to Deliver Quality Ceiling Mount. Christie is partnering with Euromet to deliver a professional quality ceiling mount capable of supporting more than 20 Christie projectors. Christie One Mount is a modified version of the popular Euromet Arakno mount, but also includes a quick release pin to allow for easy projector serviceability. The Christie One Mount features a white and stainless steel color combination with a white ceiling mounting plate.